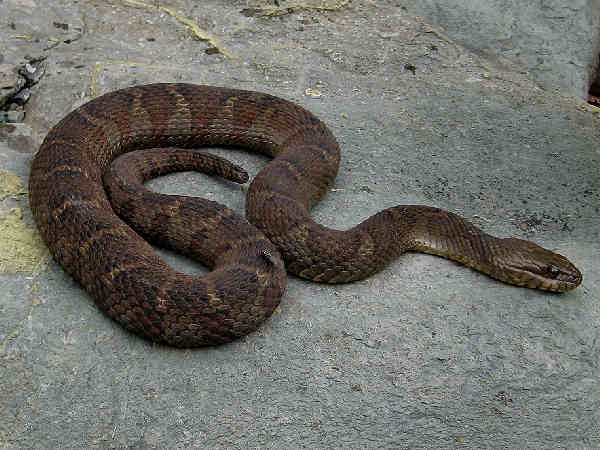 Delaware snakes inhabit an area right on the north south boundary of common United States snake territory. Of the nineteen species of Delaware snakes, all of them are found in the south in an area known as the Delmarva (Delaware, Maryland and Virginia) peninsula. Most of the snakes are forest dwellers so they like a nice healthy mixed deciduous or mixed deciduous/coniferous forest down here on the mid-peninsula. Up north they are primarily found in rocky slope areas up on the piedmont. But they really do need a fairly large, somewhat healthy woodlands which is fairly rare today. Here’s a quick overview. Please press the snakes button for additional snake pictures and information. Rat snakes are the general name given to a group of constrictors that inhabit various regions of the East and Midwest. Their rodent diet and their propensity to inhabit areas with human populations often translated into the humans calling them rat snakes based primarily on the snake’s diet. 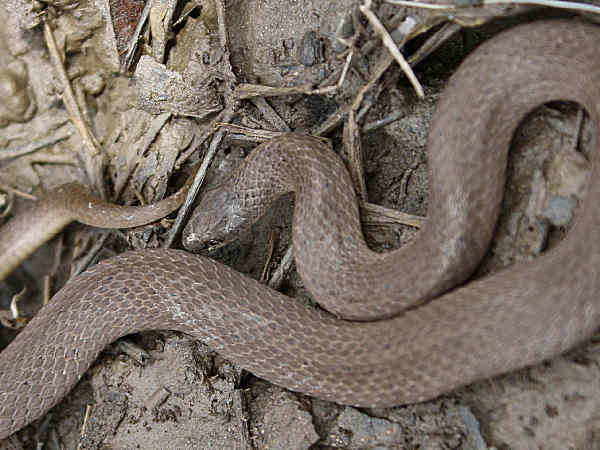 While many of the species have common names with rat snake included, other species are known as Corn Snakes and Fox Snakes. Their large size and fairly docile manner means there’s always talk about them in the reptile trade. Probably the corn snake is the most common of the species in the pet trade. Delaware hosts both the Black Ratsnake and the Corn Snake. 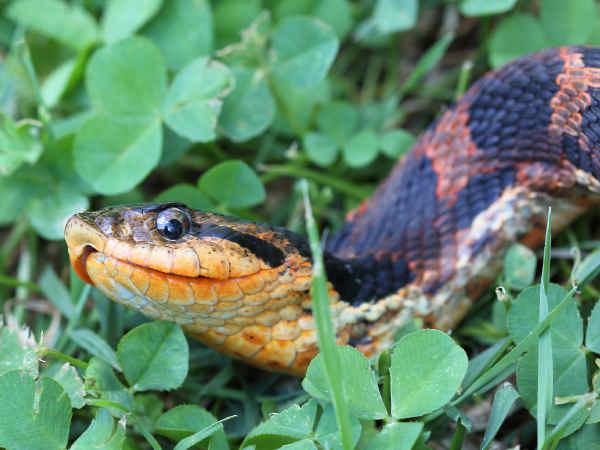 Rat snakes rank as one of the most common of all Delaware snakes. 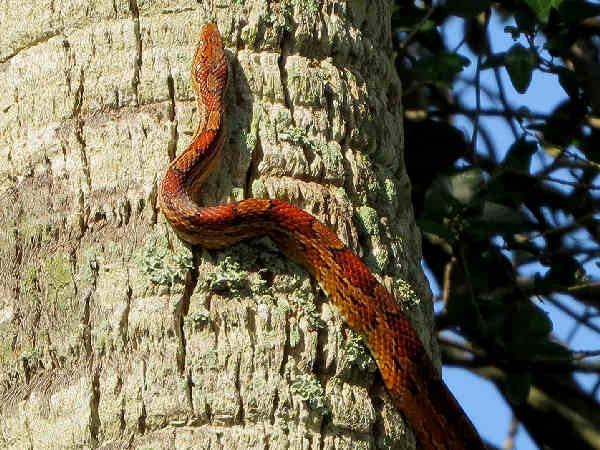 The picture shows the less common and more colorful Corn Snake, another species popular in the pet trade. While all snakes possess the ability to swim, Water Snakes (genus Nerodia) get their name because of their close association with water habitats. With the exception of the Pacific Northwest, nine different species inhabit most areas of North America. All but one species, the Salt Marsh Snake (Nerodia clarkii) inhabit fresh water areas from small ponds to large rivers. The Northern Watersnake (Nerodia sipedon) is another very common Delaware snake. 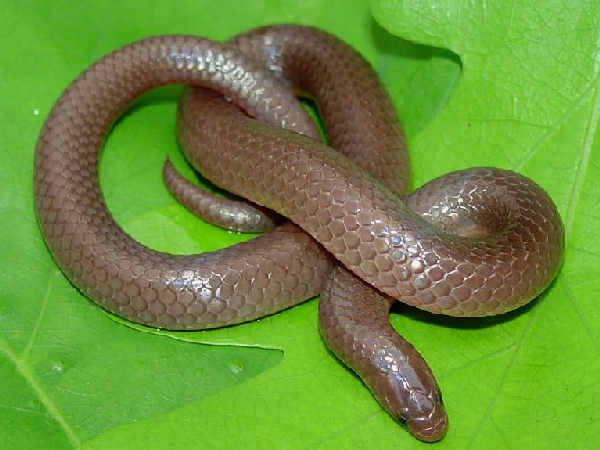 Plain-bellied Watersnakes (Nerodia erythrogaster) also live in the state. 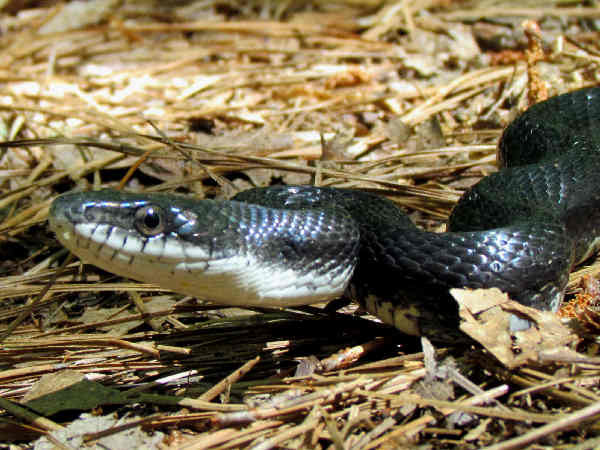 The snakes best known as Black racers inhabit most areas in the East from southern Maine to the Florida Keys. They are long, thin snakes with a black body, and as the picture highlights, white chins. Eastern Hognose snakes (Heterodon platirhinos) can assume a variety of colors and are the most wide ranging of species. Delaware is also in their range. Most people do not come across hognose snakes because they spend most of their above ground time hiding among tall grass and brush. Eastern Kingsnakes (Lampropeltis getula) are one of Delaware’s two Lamproteltis snakes, generally called the kingsnakes and milksnakes. 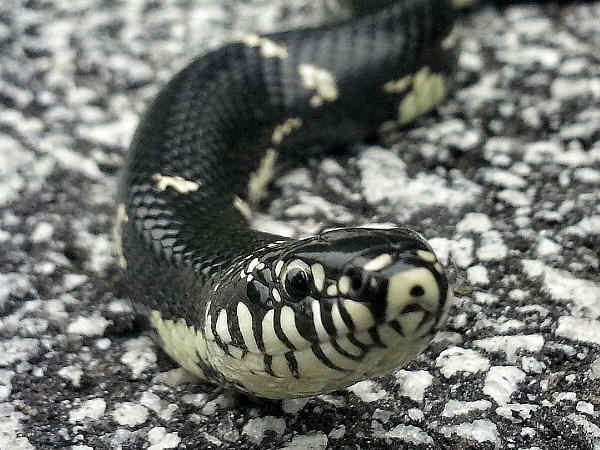 A snake with a black body along with a series of thin white bands down the back is the best way to differentiate Delaware’s Kingsnake population from its racers and ratsnakes. 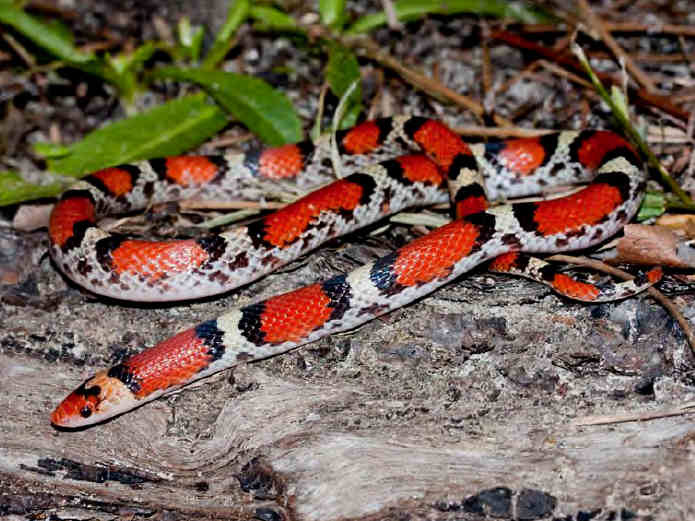 Eastern Milk Snakes (Lampropeltis triangulum) also rank among Delaware’s more colorful and adaptable snakes. They inhabit a variety of areas such as fields, forests and neighborhoods. It’s easy to mistake the Scarletsnake (Cemophora coccinea) for a Milksnake or Kingsnake. They are a separate genera and fairly common in the Southeast. Delaware is close to the northern edge of its range. A red face and red blotches surrounded by black bands are good field identification clues. Delaware hosts one of the five native copperhead subspecies. Their diet consists primarily of rodents in their territory, and unless directly disturbed, they are not known to be particularly aggressive in the presence of humans. 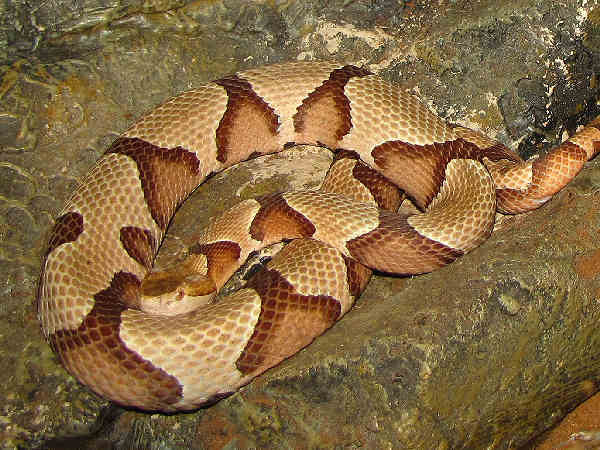 Copperheads grow to an average three feet in length and their light body is covered with darker crossbands. The head shows a characteristic copper color.